Looking great in the winter comes naturally—when you have a winter beauty plan. Follow these beauty tips for top-to-bottom, inside-out, frigid weather fabulosity. Fashion preferences notwithstanding, staying gorgeous long term requires a little TLC from your wardrobe. Invest in a pair of cotton-lined gloves and wear them when temperatures drop to about 40 F (4 C) to keep precious moisture in your skin. Purchase a coordinating scarf to wrap around your face when cold winds threaten to dehydrate facial skin, and top off your look with a fashionable hat to keep you warm while also protecting the condition of your hair. Be sure you have a pair of rubber gloves by the kitchen sink to use when hands are immersed in water. For a softness boost, rub on nourishing hand creme containing shea butter or jojoba oil before pulling on the gloves. It may be cold out, but a great deal of sun damage can happen while we pursue winter sports such as skiing and skating. Protect skin with natural sun blocks such as titanium dioxide and zinc oxide. Wear UVA- and UVB-blocking shades to shield eyes and prevent wrinkles from squinting. 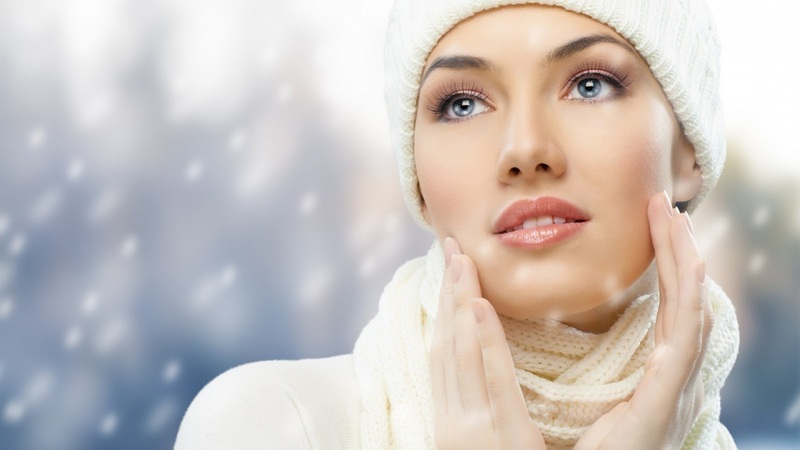 The cold winter air slows blood circulation in your skin, contributing to your seasonal pale. Stimulate your circulation and tone your skin through regular dry brushing. All you need is a long-handled, natural bristle brush and a few minutes before your shower. With dry skin and brush, start at the soles of your feet. Use long, firm strokes and brush upward on your bare skin toward your heart, covering each area only once. Brush across your buttocks, and use a counter-clockwise motion on your stomach and abdomen. Finish with your arms and each hand, remembering your palms. Start with gentle pressure, and as your skin becomes more fit and firm, you’ll be able to work more vigorously. Follow with a rinse in the tub or shower. Healthy skin begins with a clean slate. During winter months, use an emollient-rich body wash when you shower or bathe, as bar soaps can be dehydrating. If you have extra-sensitive skin, simply lather coconut oil onto your body before you enter the shower, and gently wash with a cotton cloth. Coconut oil and olive oil are excellent facial cleansers if your skin is dry or dehydrated, and are even able to remove makeup. If you have oilier skin, try cleansers containing botanical soapwort (Saponaria officinalis) or Castile soap, which is a simple combination of olive oil and soda. Give yourself a hot oil treatment as you do chores or soak in the tub. Simply apply a coin-sized amount of olive or coconut oil to dry hair. Cover hair with plastic shower cap and wrap a towel around your head. Natural body heat boosts the oil’s ability to condition hair. After 15 minutes, shampoo as usual. Cold winds and furnace-dried air parch skin and hair. Use emollients such as healing jojoba, sweet almond, or Moroccan argan oil to replenish moisture. Look for products containing nicotinamide (B3), which helps to increase epidermal lipogenesis and improve skin barrier function. Always moisturize when skin is slightly damp. While cold sores have nothing to do with the temperature, winter weather can boost stress, while being trapped indoors with bacteria and viruses often taxes your immune system, triggering an outbreak.